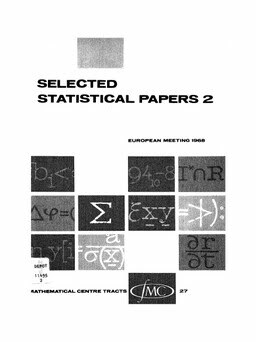 Selected statistical papers, part 2 : [selection of papers of the European meeting 1968 on statistics, econometrics and management science, Amsterdam, 02-07.09.1968]. (1968). Selected statistical papers, part 2 : [selection of papers of the European meeting 1968 on statistics, econometrics and management science, Amsterdam, 02-07.09.1968]. MC Tracts. Centrum Voor Wiskunde en Informatica.